Researchers from Arizona State University found that fetal cells interact with women's bodies, helping prepare them for childbirth, but sticking around after, too. Mother Nature does everything in her power to help our bodies during pregnancy in order to create children, but afterward? She's not always too worried about us. At least that's how it appears, based on a new study from Arizona State University. Researchers found that cells from a growing baby migrate from the placenta and move to other areas of the a pregnant woman's body, like her heart, liver and even brain. Some of these cells can benefit the mother-to-be, a few simply act as visitors to the body without inflicting any harm, while others have the potential to wreak havoc on a woman's health years—and even decades—after she's given birth. During pregnancy, fetal cells take charge outside the womb, redirecting nutrients from the mother's body to the baby, helping the little one grow. After delivery, these same cells are shown to help damaged tissues—like those found around C-section incisions—heal. Data also suggests that the fetal cells play a part in forming the emotional connection between mother and baby by controlling the triggers that release oxytocin, the bonding hormone. That's all great, given that moms want nothing more than to provide a healthy, thriving environment to help their babies develop and thrive. But these same cells also have the potential to contribute to inflammatory responses and autoimmunity problems like rheumatoid arthritis in the mother because the body tries to fight them off as foreign entities. Data suggests that a higher number of these cells are also found in the blood and tissue of women with Hashimoto's, Graves' disease and thyroid cancer. Then there's how it affects breast development and milk production. 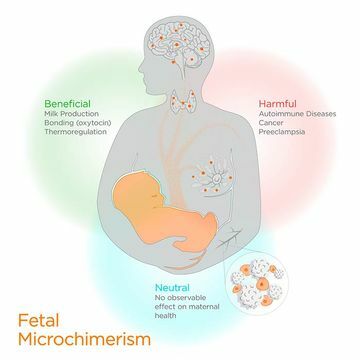 Researchers in the study found that a low amount of fetal cells in the breast tissue could contribute to problems ranging from low breast milk production to even breast cancer. While this might sound scary, the findings are extremely important to help better understand how pregnancy affects mothers—and change how medical professionals find, approach and treat the diseases in both new moms and women in general. Want to be freaked out and amazed by your body at the same time? Watch this video from the research team at ASU. We promise you'll have a new-found respect for your growing bump.